Easily slide small, Neapolitan-style pizzas in and out of your pizza oven with this American Metalcraft 17080 8" round pizza peel! 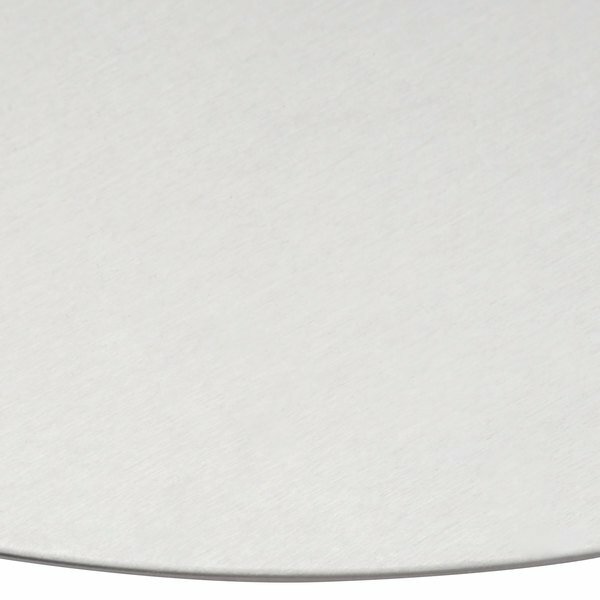 This American Metalcraft 17080 8" round pizza peel is the money-saving alternative to wood pizza peels that you've been looking for. The 12" long wood handle helps you steer your pizzas in and out of your oven, just like a wood peel, but the 14 gauge aluminum blade ensures longevity and cost savings. 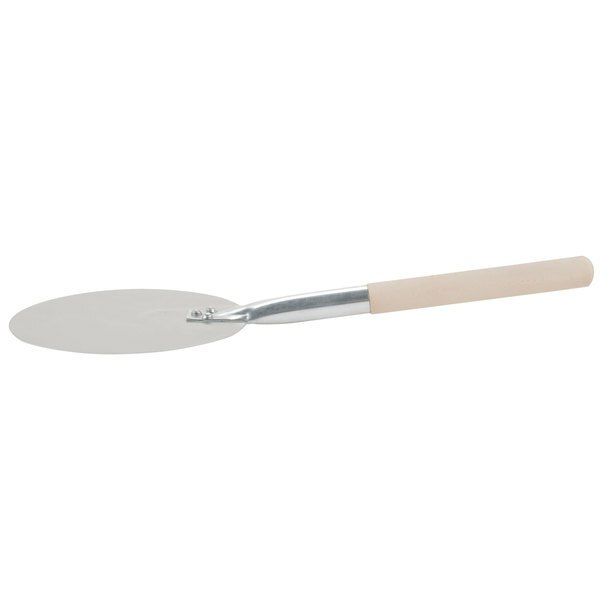 This pizza peel is perfect for pizzerias looking for dependability without breaking the bank. 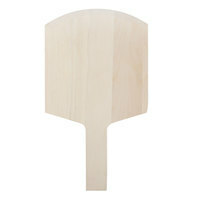 "I needed a small round peel like this is in order to rotate my pies and take them out of the oven. 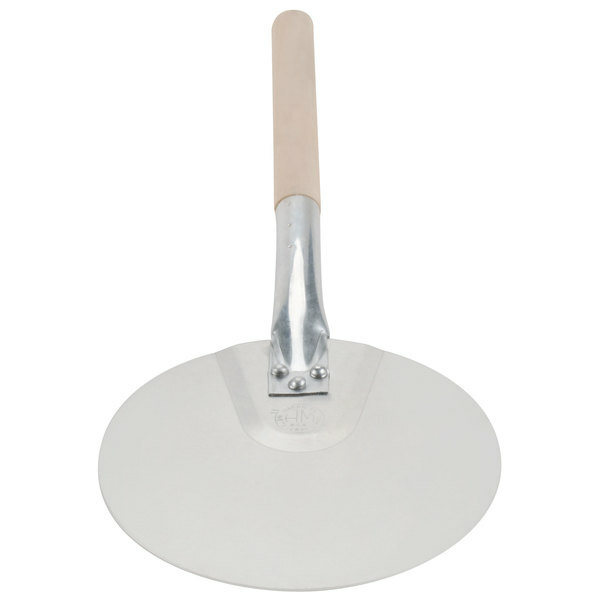 This peel is sturdily built and has a nice, long handle to make the job easy!" 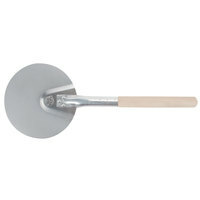 The round shape makes this pizza peel great for Neapolitan-style pizzas. The 8" diameter means that it is designed for small-size pizzas. 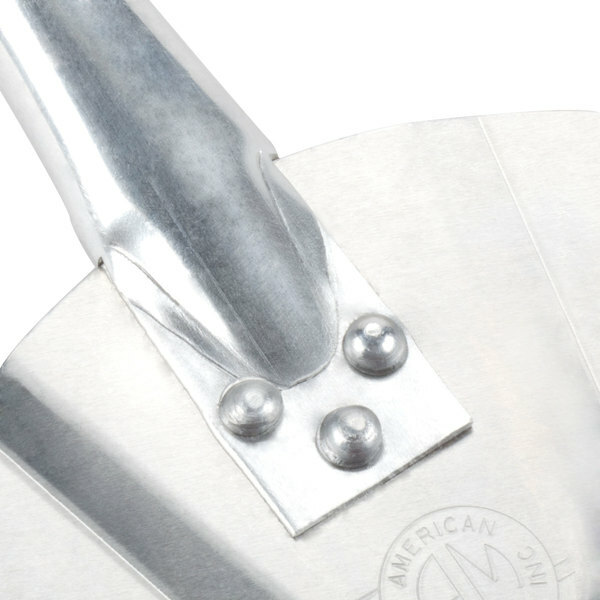 The easy-to-clean aluminum blade is light in weight compared to other metals. 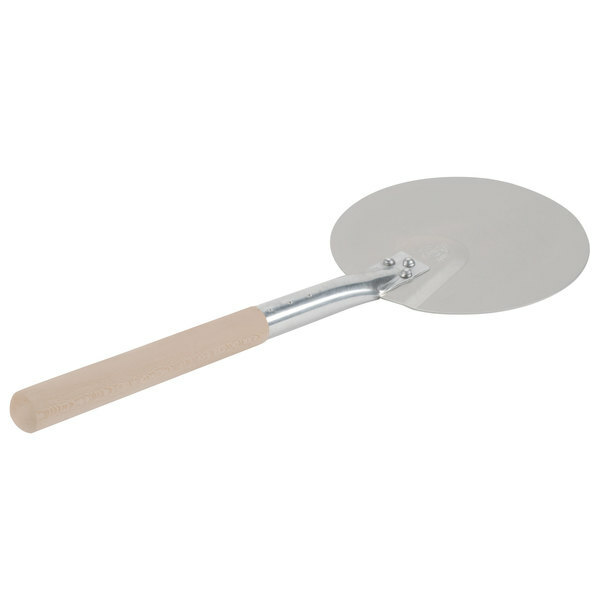 With a 14 gauge aluminum blade, this pizza peel is guaranteed to last in a commercial kitchen. It doesn't need to be seasoned, like comparable wood peels would, and it won't absorb unwanted odors or food particles, ensuring a perfect pizza every time. 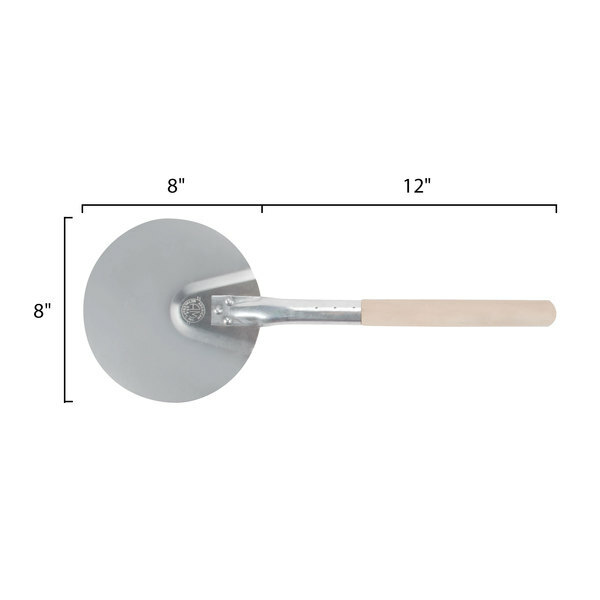 This pizza peel's blade measures 8" in diameter, making it ideal for moving small, Neapolitan-style pizzas to and from your pizza oven. 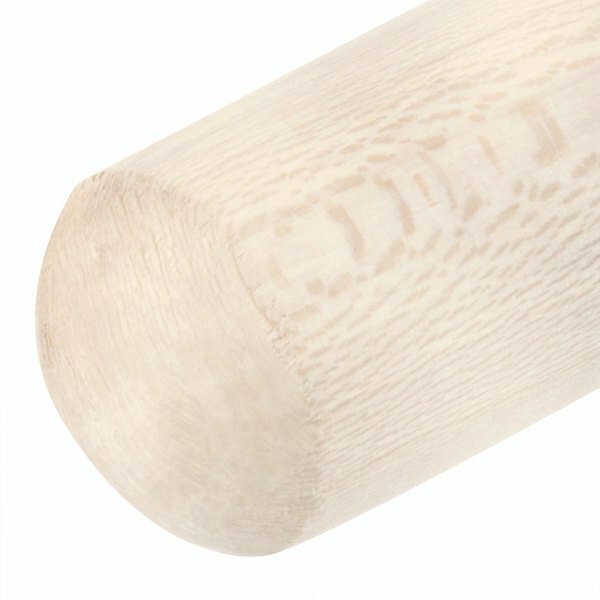 The 12" long wood handle remains cool to the touch during use. It's triple-riveted to the pizza peel's blade for a safe, secure connection that you can count on. Plus, its perfectly-portioned 12" length means it is long enough to safely allow for pizzas to be placed in an oven and to be removed from an oven, too, but it's not so long that it gets in the way of your bustling kitchen. Like the size and feel. Great for working events with a small often and personal pies. I wouldn't use it on larger pizzas, but I think anyone in the business knows what size peel they need. If you need something for personal pies and a smaller oven, then this will do the trick. Great but small peel, i think this one works better with a long handle, but the quality is really good, works great for a short oven. Excelent Product!! 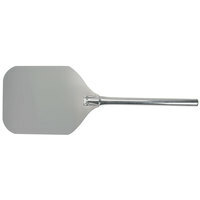 I love this one is amazing perfect aluminim shape round, the wood handle its really strong perfect to work in the oven, is amazing!! I purchased this as a gift for my daughter (a chef) to yes with her small pizza oven. She loved it! Perfect size, great quality and the price was fantastic. This this is so cute and tiny. But it does the job of turning pizzas in the oven. I can turn a pizza up to about 14 inches with this thing. Anything bigger and I'd prefer the larger round size. I needed a small round peel like this is in order to rotate my pies and take them out of the oven. This peel is sturdily built and has a nice, long handle to make the job easy! 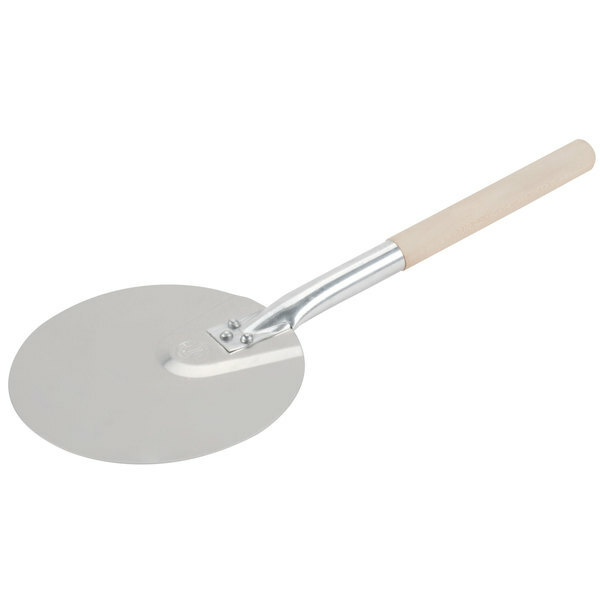 eight inch metal pizza peel comes in handy for turning pies while baking. good quality construction made of non corrosive aluminum. nice addition to the pizza arsenal.